Sorry for the long gap between my last post! Ive been updating lots on my personal facebook page but need to remember to transfer that to my business page and blog =) All is well, winter is in full force here in Melbourne with its beautifully crisp clear mornings and cosy evenings next to our little gas fire. 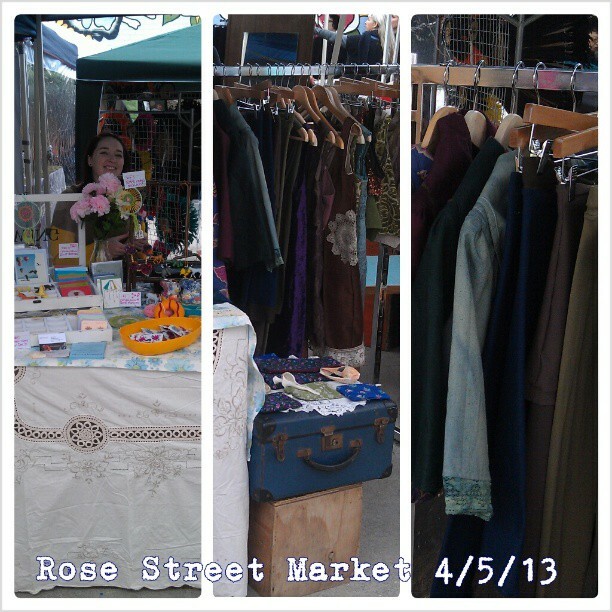 So here is a little update post with some pictures of my last 2 Rose Street Markets. 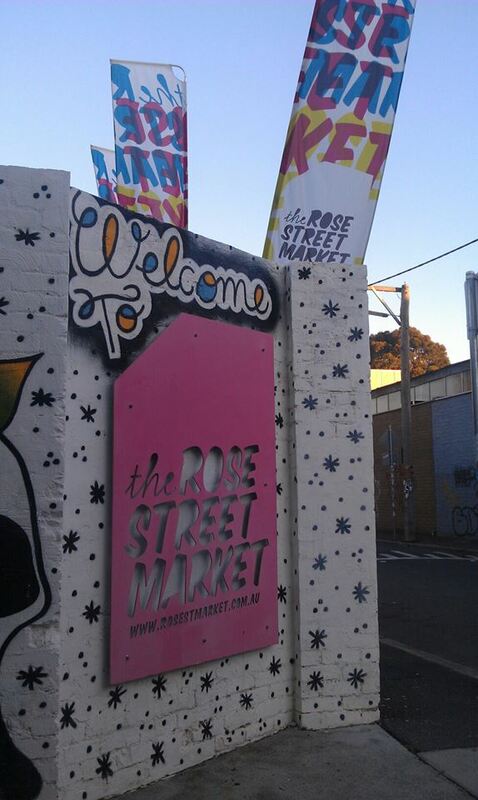 Rose Street Market is an all-year-round market in the seriously funky neighbourhood of Fitzroy, Melbourne. 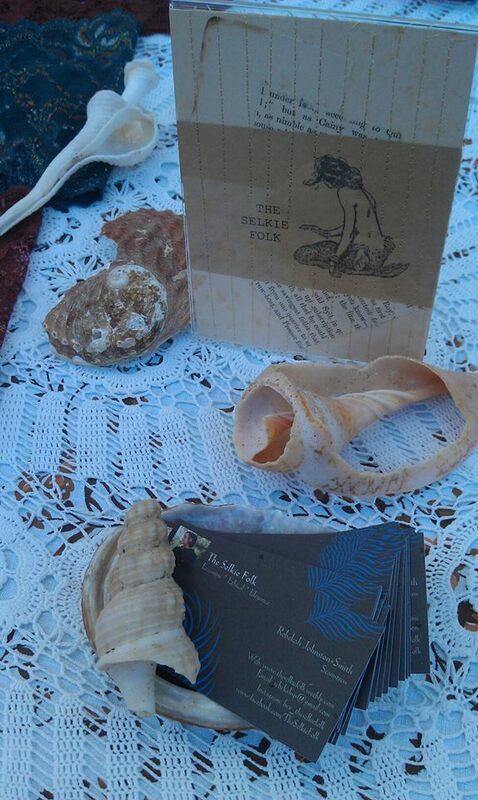 It is an Artist/Handmade market which has been going for about 10 years now and is run by 2 lovely brothers from Melbourne. Chris is the brother that I have got to know through doing the market, he is so helpful and supportive, and I love that he always comes round at the end of the day to check in and see how the day went for you. He is very helpful and efficient, even though he is insanely busy throughout the day. I love this market, not only for the amount of footfall that it receives, but also that the organisers are so so friendly, its super special because of this and thus has a very loyal following. The market, espececially during the summer months, has a very festivally sort of vibe with colourful stalls and musicians playing throughout the day. There is also an outside cafe which sells amazing tastey homemade food and drinks for stallholders and customers at reasonable prices. At the moment the market is less packed then it usually is due to it being cold and wintery but a lot of stall holders brave it out no matter the weather. The market is actually an olds mechanic yard just off of Brunswick street, so there is a large inside trading space as well as an outside concreted yard filled with sellers, so even on really rainy days the inside space is still totally usuable. 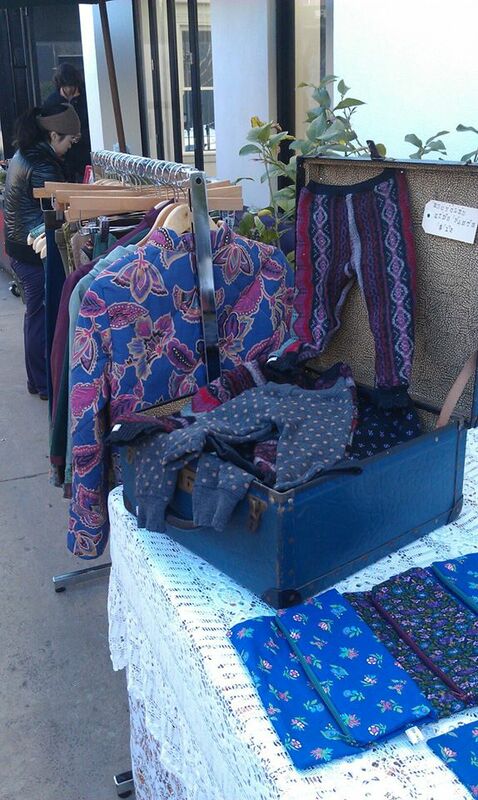 I love this market because there is such a large range of products on offer, and they seem to really stear clear of the ‘vintage’ stalls too, focussing on local artists and designers instead, with the occasional stall of customised vintage clothing. 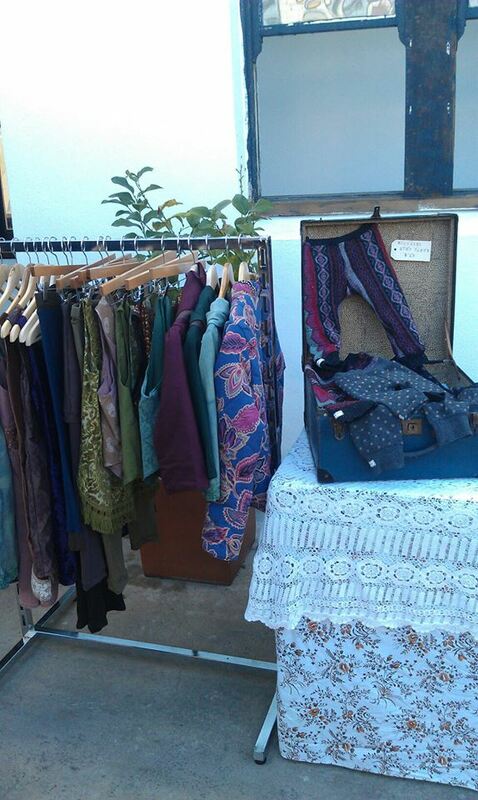 There are stalls with quite high-end fashion peices that are $100 and up, as well as handmade peices for men, women and children made from recycled materials for lower prices. There is a variety of stalls specialising in Jewellery, graphic design, candles and home decor as well as the occasional stall popping up cutting hair and painting nails….the stalls are different every week and so interesting to browse through. I love wandering through when I get a minute and seeing how everyone lays out their space. When you book a stall on either the saturday or the sunday slots you recieve a space, a gazebo(if you arrive early enought!) and a variety of different wooden cubes to use to create a table and display your peices. Here are some images that I have taken in my last 2 markets, the first being early may and the second being late june. 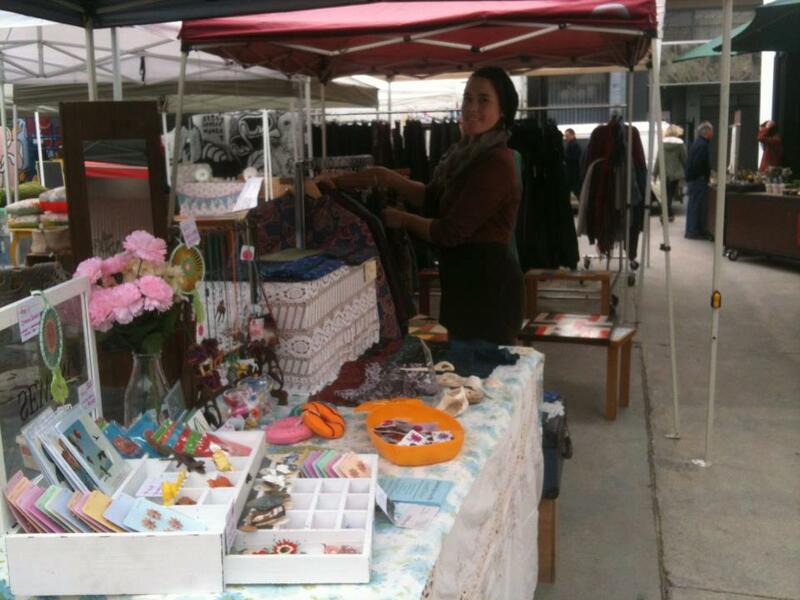 I shared this market stall with my lovely crafty friend Millie from Makadactyl (https://www.facebook.com/Makadactyl) who creates awesome jewellery peices, crochet pins and handsewn badges etc, beautiful colourful creations! Though the day was autumnal and a bit grey to start off with, it was a lovely first day at Rose Street, we met some lovely customers who left with some homemade goodies, and also connected with some fabulous other local artists particularly the LOVELY Jade from Tibbs and Bones who creates amazing headdresses and reworked vintage peices (https://www.facebook.com/TibbsAndBones). I came home with a profit, which was more then I was expecting as I just wanted to cover the $70 stall charge and anything more was a major bonus. 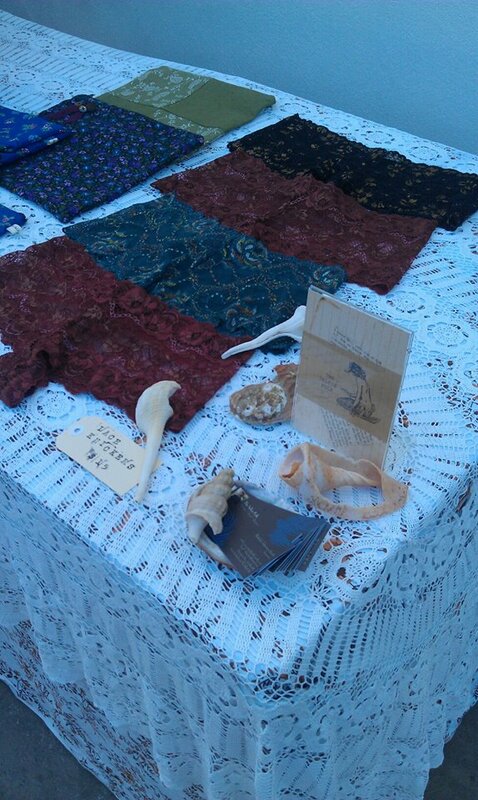 My handmade French Knickers were a definate success, and I also ended the day with a commission for a low back brown velvet dress from a lovely local lady. 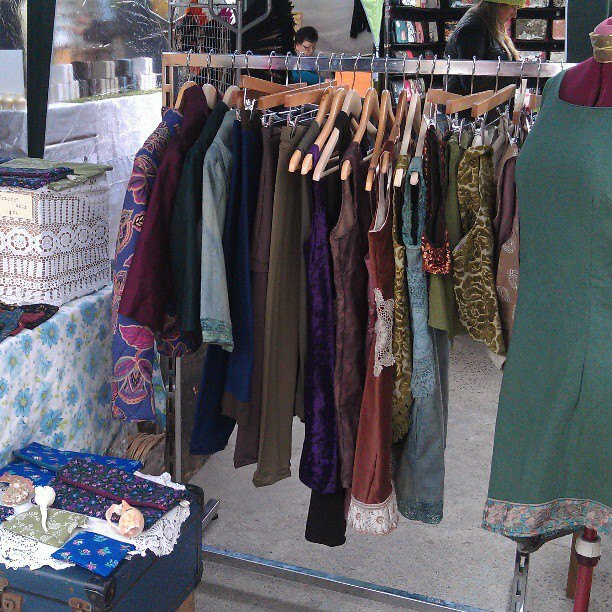 I ended up doing this market on my own, minus the lovely Millie who was poorly. I was pretty apprehensive going solo but the day panned out to be a beautifully crisp morning with warm winter sunshine by midday bringing in lots of people off the streets after their sunday brunches. I spent my day crocheting panels for some tops I have in the works, and chatting away to the lovely Kirri from Kirri-maDe (https://www.facebook.com/kirrimaDe) who creates beautiful funky resin jewellery, and the fabulous Miranda from MDdrawn (https://www.facebook.com/McDrawn) who is an illustrator/painter and graphics wizz and had amazing prints, clothing and cushions for sale. Lovely ladies who you should definately check out! The day was warm, relaxing and flew by until about 3 30pm when the sun got a bit too low and the temperature dropped! 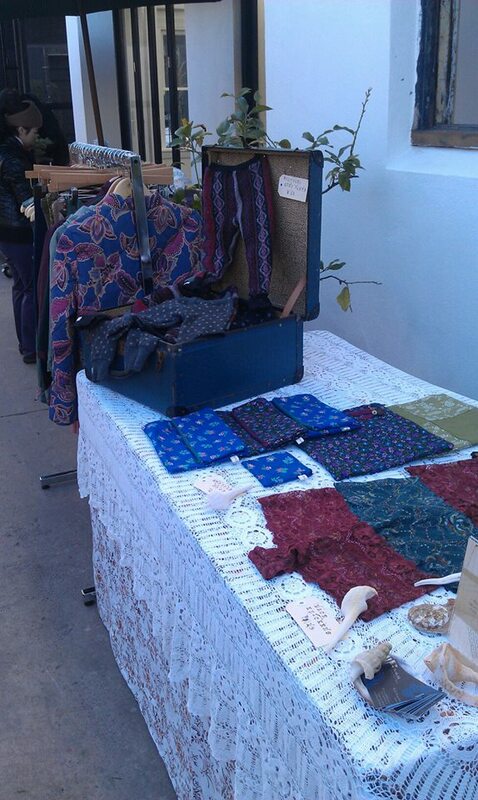 I sold a fair few of my recycled kids leggings (which got everyone maternal and went down a real storm) and a couple of pairs of my French Knickers. The clothes rail got some notice, but noone seemed to want to strip of their winter layers to try anything on, a hazard of winter market selling which I WHOLEHEARTEDLY understand. All in all a lovely day, with some very happy customers. I came out of the market with a realisation that kids clothes SELL, especially during winter when noone wants to try anything on…so onto making a big collection of recycled kids leggings and dresses I think! I havn’t got any more Rose Street stalls on the calendar yet, but may well be taking over some of my new friend’s unwanted stalls over the next month or so. I love the experience of learning how to greet customers and make my stall interesting and inviting, and its a lovely feeling to see people’s excitement about my products whether they purchase something or not. Thankyou all for your lovely comments and support, its wonderful to have some subscribers and I’ll make sure to keep this page more regularly updated with my new creations, inspiration and pictures.